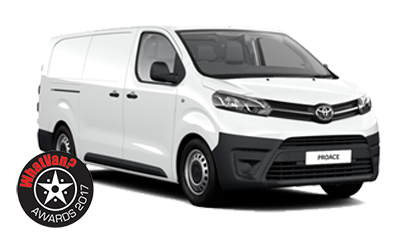 At Vansdirect – the UK’s number 1 van retailer – we have a huge range of new Toyota vans for sale, available at competitive prices. Our independent experts provide impartial advice, so whatever your trade, we can find the right new Toyota van for you and your business. The Toyota van range includes WhatVan’s LCV of the Year for 2017, the Proace and Hilux. We offer a number of flexible finance options for your new Toyota van including Finance Lease, Contract Hire and Hire Purchase.